Journal of the Indian Ocean Region Publication: http://www.tandfonline.com/loi/rior20 Published online: 05 Aug 2015. This historical novel traces the life of its protagonist Sakina, a second-generation Asian woman of a merchant caste in early to mid-twentieth-century Kenya. 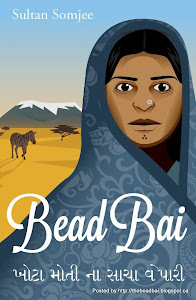 The title of the book, Bead Bai, refers to Asian women of this era who worked as beadwork embroiderers known by the Gujarati honorific bā’ī, which may be prefixed or suffixed to names of women such as Sakina’s step-grandmother – Ma Gor Bai. The subtitle of the book is in Gujarati – khōṭā mōṭī nā sācā vēpārī – is the clever turn of phrase on the sign of Sakina’s family business that loosely translates as ‘honest merchants of false (i.e. imitation) beads’. Sakina was born in Kenya and appears to be of Kāṭhiyāvādị̄ origin. She grows up with her stepmother, who migrates to Africa and later becomes a widow and is subject to the Indic cultural practice of shunning due to her bad fortune. Sakina is married off early to a Momna family and leaves Nairobi for Nairowua in Masailand, which straddles the southern border of Kenya and northern Tanzania. Marriage is difficult for her and here Somjee provides interesting cultural sayings that illuminate the intimate life of the characters, such as consolation given to her about her wedding night, ‘you will heal from the sore of a man when the red henna on your hands fades’ (p. 269). Sakina finds escape from the restrictions that her husband’s family imposes on her through communication with the Masai as a dukawala (‘storekeeper’) selling beads and other sundry supplies. Her learning of the organic spiritual patterns that compose the female Masai beaded collar, the irpusi or esosi, allows her creativity real expression. Recognising her power and position as an expectant mother, she has her stepmother brought from Nairobi to assist her in childbirth and shortly afterwards the novel ends with her return to her childhood home with the newborn son. Somjee’s novel is based on nine years of research interviewing these women who were and are now in Western Europe and North America. The amount of material he was able to capture helps to recreate this world of Asians in Africa that has been neglected in the national narratives of postcolonial Sub-Saharan African states. The political instability and hostility towards Asians that reached its climax in the 1972 expulsion of Asians from East Africa dealt a deathblow to many of the scattered communities of Asian merchants throughout eastern, central, and southern Africa. From their initial settlements of the Zanzibar littoral, two hundred years of African settlement created a unique culture that was Indic in origin but African in expression. Unlike the ambiguity, conflict, and contestation between African and Asian identities that characterises M.G. Vassanji and Shajila Patel’s writings, Somjee’s protagonist finds her realisation of being and completeness by embracing African civilisation. A sense of melancholy pervades Bead Bai for the loss of Khōjā culture that saw its fullest realisation in colonial Africa. Somjee refers to the communal world he creates as that of the ‘Satpanth Khoja’. This caste identity has almost been lost in 2015 period as the Khōjā define themselves along three Islamic creedal identities of Sunni, Ithnā ʿAsharī, and Ismaili. The South Asian origins of the Khōjā are unclear, but the communities that developed in the late nineteenth-century Africa developed mercantile networks from the littoral to the interior of the continent. They followed religious practices that were grounded in vernacular liminal devotion that later was discretely characterised as Hindu or Muslim. According to Somjee, the ‘Khoja Gita’ (p. 38) was an important text that was ritually recited invoking an Indic narrative of creation. Interacting with other Asian castes in Africa, such as the Lōhāṇā, qua a Khōjā identity allowed for a camaraderie that mirrored the long dhow voyage. While rhetorically concomitant, Khōjā identity prefigured the Ismaili identity of the community. Khōjā identity was dynamic and brought an ethnic pan-Asian solidarity to the fore in opposition to the Swahili, Omani, etc. As became the case with the western diaspora of the East African Khōjā, ones coreligionists can be different from caste brethren and herein lies the loss that is echoed by other contemporary African Khōjā authors, such as Hassan Jaffer. They are devout believers in their modern Islamic creed and yet feel great sadness for the loss of an ethnic Khōjā identity that has been subsumed within modern Near Eastern modelled forms of Islam, on which communal authority is based. They cite the loss of Gujarati and exogamy as examples of how the Anglophone Khōjā have forsaken their heritage. From this perspective, the Khōjā have become unbound from their ancestral lineage and duties of filial piety by embracing a secularist ethos of individualist consumerism. Jaffer presciently asks of the future in the subtitle of his latest book, Whither Khoja? Bead Bai is an invaluable contribution to the foundation of what Emma Hunter describes as ‘intellectual history from below’ in African studies. There is a lacuna of research on how Indic religious cosmologies developed in the context of transnational migration throughout the western Indian Ocean. Indic religions were foundational in the shaping of social, political, and economic institutions that Asian communities developed in Africa. Much of Khōjā communal histories focuses on great traders, such as those of Alidina Virsam and Nasser Nurmohamed. The voice of women, the poor, and those in the periphery of the jamāt (‘community’) structure are rarely found. The fact that many of the original African Khōjā communities have disappeared and those that remain have an identity shaped more by Edmonton and London than Zanzibar. This means that these narratives will endure as an epitaph of the dynamism that Africa once provided for the development of the Khōjā. Khōjā Studies benefits greatly from such thoughtful and well-researched historical novels, such as Bead Bai and Allidina Visram. This form of historical fiction is a popularly accessible preservation of life experiences and perspectives on the past to be understood as a lens for examining the historical continuity of migration and dynamic identities that undergird the present. Communal historians, such as Somjee, are an important part of the subaltern writing of multivocal western Indian Ocean transnational histories. To wit, the more that participate in its thinking, discussion, and writing, the richer and more complex our understanding of this cosmopolitan period of Asian African history.